Despicable Me (2010) is an animated comedy movie about a supervillain named Gru, his villainous plan to steal the moon, and how his life is changed by three little girls. Storyline by IMDb: In a happy suburban neighborhood surrounded by white picket fences with flowering rose bushes, sits a black house with a dead lawn. Unbeknownst to the neighbors, hidden beneath this home is a vast secret hideout. Surrounded by a small army of minions, we discover Gru (voiced by Steve Carell), planning the biggest heist in the history of the world. He is going to steal the moon. (Yes, the moon!) Gru delights in all things wicked. Armed with his arsenal of shrink rays, freeze rays, and battle-ready vehicles for land and air, he vanquishes all who stand in his way. Until the day he encounters the immense will of three little orphaned girls who look at him and see something that no one else has ever seen: a potential Dad. The world's greatest villain has just met his greatest challenge: three little girls named Margo, Edith, and Agnes. 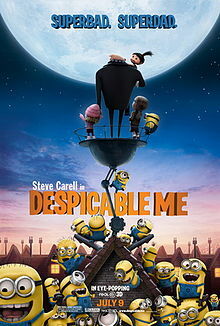 Despicable Me is a heart-warming animated movie with enough love to melt your heart. You just gotta love those adorable yellow minions and the three little girls. There's enough humor to crack you up laughing, and great animation that keeps you on the edge.